Photography by Stephen Charles (click for photographers Flickr page). Prophetic pragmatism, one of the most fully elaborated and progressive expressions of post-Marxist politics in the present era, appeals to academicians, politicians, and business leaders precisely because it poses no serious threat to the class of individuals who control and appropriate the lion’s hare of the Earth’s resources and humanity’s collectively generated wealth. [I]t seeks to implement a reform agenda that attempts to address the needs of both rulers and ruled by establishing cross-class alliances on the grounds of shared moral, parental, or national identity…and…it seeks to solve human problems without challenging the moral legitimacy and social consequences of privatized control of production and planning of social development (185-6). Wood, Mark David. 2000. 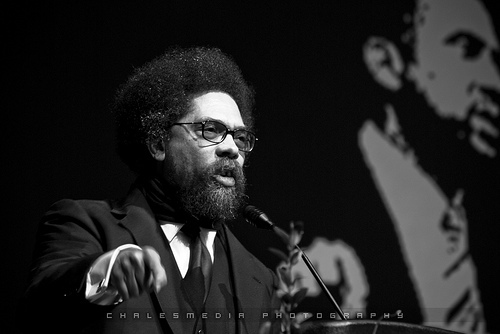 Cornel West and the Politics of Prophetic Pragmatism. Illinois: University of Illinois Press. Lefebvre, Henri. 2009. Dialectical Materialism. Translated by John Sturrock. Minneapolis: University of Minnesota Press. The events we have studied occurred at a particular moment of the historical process, in a particular field defined by class struggle; and the class struggle itself takes place between [individuals] who are produced by the contemporary mode of production…Conversely the working class defined itself by and through this struggle by its degree of emancipation, that is to say, both by its practices and by its consciousness of itself (which amounts to the same thing). But in truth, the workers’ tactics, the militancy of the proletariat and its degree of class-consciousness are determined not only by the nature, differentiation and importance of the apparatuses (unions, etc.) but also by the more or less immediate opportunity for serial individuals to dissolve their seriality in combat groups, and by the aggressiveness, violence, tenacity and discipline of these groups themselves in the course of the action they undertake (699). Satre, Jean-Paul. 2004. Edited by Jonathan Ree and translated by Alan Sheridan-Smith. Critique of Dialectical Reason: Volume 1. New York: Verso. On a critique of Rosa Luxemburg‘s (1871-1919) “Critrique of the Russian Revolution” György Lukács points out the mistake of just solely focusing on the proletariat in countries that are majority non-proletarian, such as Russia, which had been mostly peasant and feudal based. [Her essay] consists in the overestimation of its purely proletarian character, and therefore the overestimation both of the external power and the inner clarity and maturity that the proletarian class can possess and in fact did possess in the first phase of the revolution. And at the same time we as a corollary the underestimation of the importance of the non-proletarian elements in the revolution. And this includes the non-proletarian elements outside as well as the power wielded by such idologies within the proletariat itself. And this false assessment of the true driving forces leads to the decisive point of her misinterpretation: to the underplyaing of the role of the party in revolution and of its conscious political action, as opposed to the necessity of being driven along by the elemental forces of economic development (274-5). Lukács, György. 1971. Translated by Rodney Livingstone. History and Class Consciousness: Studies in Marxist Dialectics. Cambridge: MIT Press. [I]n the movement of History, an exploiting class, by tightening its bonds against an enemy and by becoming aware of itself as a unity of individuals in solidarity, shows the exploited classes their material being as a collective and as a point of departure for a constant effort to establish lived bonds of solidarity between its members. There is nothing surprising about this: in this inert quasi-totality, constantly swept by great movements of counter-finality, the historical collectivity, the dialectical law, is at work: the constitution of group (on the basis, of course, of real, material conditions) as an ensemble of solidarities has the dialectical consequence of making it the negation of the rest of the social field, and, as a result, of occasioning, in this field in so far as it is defined as non-grouped, the conditions for an antagonistic grouping (on the basis of scarcity and in divided social systems) (346). Thus the common praxis, as the totalisation and struggle against a common praxis of the enemy, realises itself in everyone as the new, free efficacity of [their] praxis, as the free intensification of [their] efort; every freedom creates itself laterally as the totalisation of all freedoms, and totalisation comes to it through the others as a lateral dimension of its individuality, in so far as it is freely individual for them. This has nothing to do with the radical transformation of freedom as individual praxis, since the statute of this freedom is to live the very totality of the group as a practical dimension to be realised in and by its individuality. But it is true that there is a new relation between freedoms here, since in every totalisation of the group, the freedom acknowledge themselves to be the same…And the unity of this freedom beneath the shifting multiplicity of the syntheses is itself, and fundamentally, the relation between a negative unity of all (totalisation through annihilation by the enemy) and the negation of this negation to the extent that it is occasioned as totalising and that it produces itself freely on this basis (402-3).